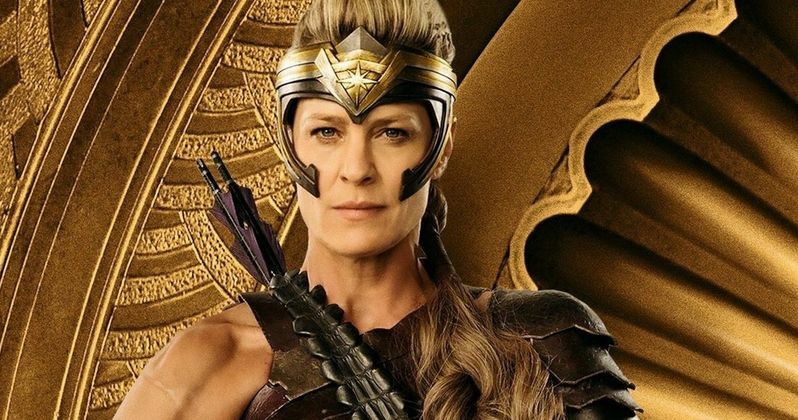 Robin Wright's Antiope to Return in Wonder Woman 1984 Flashback? Robin Wright will reportedly reprise her role as Antiope in Wonder Woman 1984 in a flashback scene with Connie Nielson, who plays Queen Hippolyta. News around the project has been relatively quiet for the past few weeks, with fans still trying to figure out who Pedro Pascal is playing or what Steve Trevor is doing back. As for Wright, she recently wrapped up filming on the final episodes of Netflix's House of Cards, which saw her take the lead after Kevin Spacey was fired from the hit show. In a new interview, Robin Wright talks about her experiences on House of Cards and her recent marriage. In the article, it states that she is preparing to fly out to Spain later this year to reprise her role as Antiope in Wonder Woman 1984. The scene in question will reportedly be a flashback to Themyscira that also includes Connie Nielson's Queen Hippolyta. It's important to note that the words are not attributed to Wright in the article. However, Wonder Woman 1984 does have sets in the Canary Islands that were built a few weeks ago. Antiope and Queen Hippolyta are two of the most important figures in Diana's life, so it makes sense that a flashback will take place. But the details surrounding that flashback are unclear at this time. Wonder Woman 1984 filmed in the Washington D.C. area for most of the summer and has now reportedly started filming in England. If the article on Robin Wright is accurate, it seems that the Canary Islands scenes will be shot in the next few months. A return to Themyscira will certainly be welcome in the upcoming sequel. Patty Jenkins and crew are doing an awesome job keeping all of the details under wraps for Wonder Woman 1984, making it to where there is a ton of mystery surrounding the film. Diana Prince may be going through some pretty rough times that correlate back to her time on Themyscira, which is where the flashback could come into play. Maybe we'll learn how Hippolyta and Antiope came to power on Themyscira, or perhaps Pedro Pascal's mysterious character has something to do with the flashback scene. Sadly, Wonder Woman 1984 is still over a year away from hitting theaters, which means that the answers to most of these questions won't be answered until then. Antiope took a bullet for Diana, and she's a very important part of her life, so it will be great to see Robin Wright back on the big screen looking like a total badass. Wright's fighting scenes were one of the many highlights of the first film, so any return to that aspect would be a welcome one. Wright will next be seen on the final season of House of Cards, which premieres on November 2nd. You can check out the rest of the interview with Robin Wright at Net-a-Porter.